Transformative change on an ecosystem scale is extremely challenging. But in the Mesoamerican Reef (MAR)— stretching 600 miles of coral reefs, mangrove forests and seagrass beds along the coasts of Mexico, Belize, Guatemala and Honduras—sustaining a rich array of biodiversity and thousands of local people, it is happening. Leaders from all four countries recently convened on a shared vision for prosperity and empowered coastal communities—setting a new course for sustainable fishing and ecotourism in the region. The government of Belize has just made major voluntary commitments at the United Nations Oceans Conference that, once implemented, will secure Belize’s fisheries as an engine for sustainable development. Healthy oceans and sustainable fisheries are crucial for poverty alleviation, food security and generating economic growth in low and middle income countries. This goal is reinforced by the United Nations Sustainable Development Goals which declare a target to “conserve and sustainably use the oceans, seas and marine resources for sustainable development.” The health and vibrancy of Belize’s coastal communities, where 15,000 people depend on fisheries for their livelihoods, depend on this target becoming a reality. Last week, fisheries ministers, fishermen, community leaders and the conservation community from around the world gathered at the United Nations Oceans Conference to share experiences and strategies for achieving this vision, and declare voluntary commitments for good stewardship of the oceans. On July 1, the Government of Belize inaugurated a managed access program for its marine reserves in order to prevent and end overfishing of important commercial species that are key to Belize’s marine environment and coastal economy. This Managed Access system is a major win for the conservation of Belize’s magnificent barrier reef as well as for the livelihoods of fishermen and Belize’s food security. Minister of Fisheries and Agriculture, Hon. 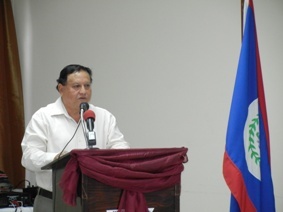 Rene Montero, inaugurated Belize’s managed access program to an audience of 60 fishermen, conservation NGOs, and government agencies. Erik Olsen presents a balanced perspective on management and conditions a Glover’s Reef Marine Reserve in Belize in “Protected Reef Offers Model for Conservation” (New York Times, Science, April 27, 2010) and “On Patrol with the Reef Ranger” (New York Times, Green Blog, April 27, 2010). 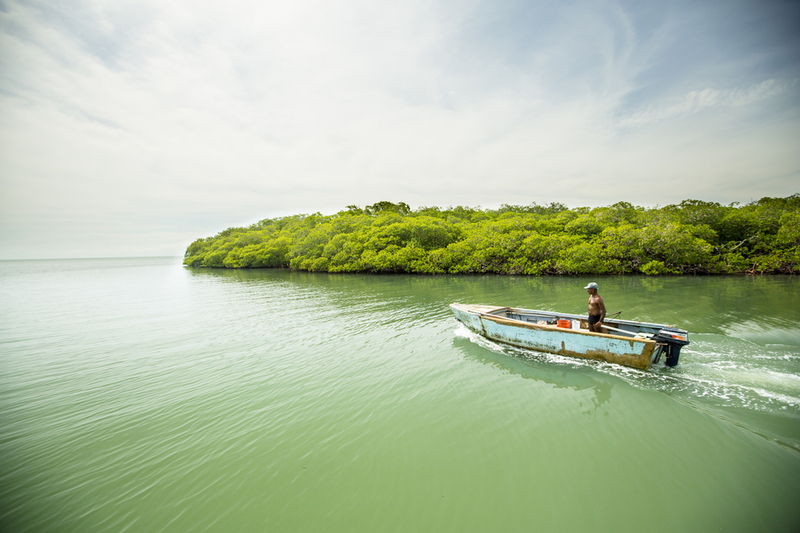 The Government of Belize has worked well with NGOs and fishermen to establish and maintain this reserve, no easy task when resources are limited. The abundant sea life and recovering sharks and rays are evidence of excellent performance at this site. 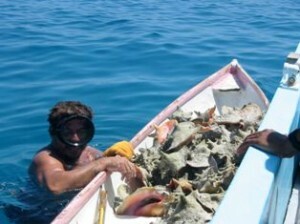 But, Glover’s Reef and other areas in Belize are under increasing pressure from overfishing. Indicators of this include an unsustainable increase in the number of fishermen, the decline in catch of targeted high-value species such as lobster and grouper, and an increase in the catching of parrotfish – a species critical for maintaining the health of the reef. The question for managers, conservationists, and fishermen is how to integrate sustainable fisheries management with the marine reserve to prevent and even reverse overfishing in the reserves. 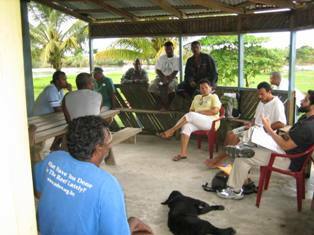 Community meeting of fishermen in Belize. In response to the threat of overfishing, Environmental Defense Fund, Wildlife Conservation Society, Belize Fisheries Department and Belizean fishermen communities have partnered on an initiative to protect and restore fisheries at Glover’s Reef and elsewhere in Belize through the implementation of innovative, incentive-based tools for fisheries management. One of the major causes of overfishing at Glover’s Reef is that it is an open access fishery. While this creates an opportunity for all to catch fish, it is also encouraging fishermen to catch too much fish too quickly. As fish populations get depleted, the health of the reef suffers and fishermen livelihoods become vulnerable. To solve this problem fishermen must either agree to end the competition and cooperate to sustainably harvest fish (cooperative fishing); or incentives can be put into place to encourage such behavior by empowering fishermen with secure shares of the catch or access to fishing grounds (catch share management). This initiative builds on the science and management work already underway at Glover’s Reef – the catch data collection that is critical to the implementation of a catch share program, and monitoring the overall ecosystem health of the atoll. Cooperative fishing and catch shares will also enable local community groups to play a more central role in the management of their fisheries, including implementing the enforcement and monitoring necessary for sustainable management. 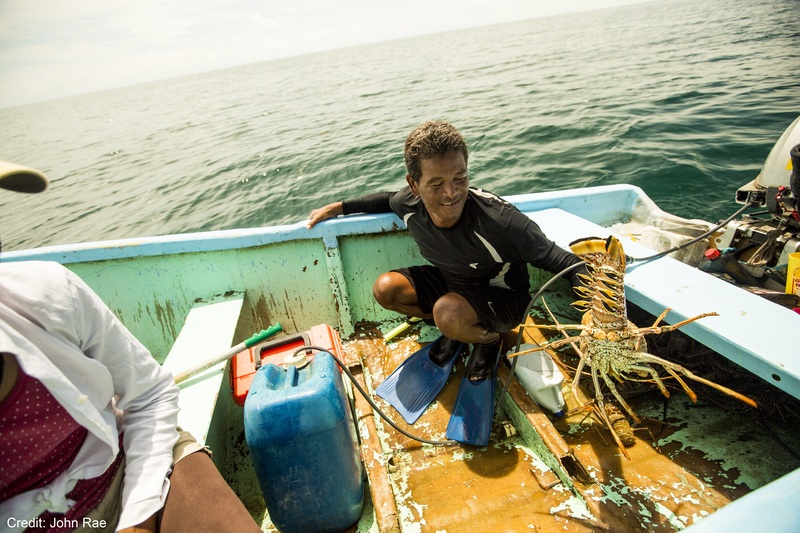 Glover’s Reef is a jewel, and a critical space for the livelihoods of fishermen and health of Belize’s Barrier Reef and the Mesoamerican marine ecosystem. Linking good fisheries management with MPAs is a critical step to ensure that current and future generations enjoy and benefit from its resources.